Gone are the days when taking a screenshot on Android was a big problem. 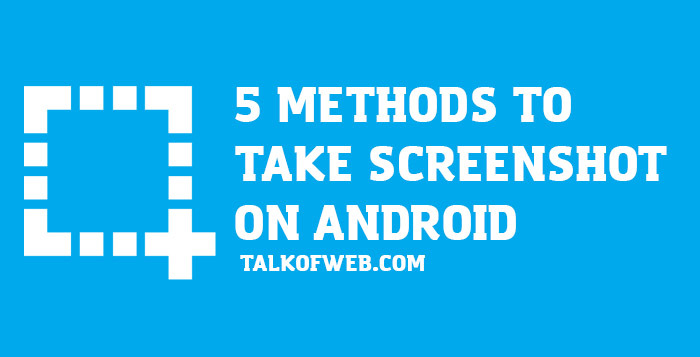 I’ll share 5 methods using which you will be able to take a screenshot on android. Some smartphones manufacturers give a built-in option for taking Android screenshot. How to take the screenshot on your smartphone? Well, do some research or google the button combination which on pressing takes the screenshot. On most of the smartphones, you can take a screenshot on Android, by just pressing the home/wake button along with volume down. The screen flashes and a screenshot is saved in the “Screenshot” album under the gallery. This feature varies from smartphone to smartphone, for example for Samsung, one needs to press home button along with power button. A combination of these two buttons takes a screenshot in Samsung phones running android. Some HTC smartphones have the screenshot option in the quick setting menu. There are smartphones which give your screenshot option on power off menu. The same menu which you use to restart or turn off your device has also the button for taking a screenshot. For example, a lot of Sony Smartphones has a similar setting. 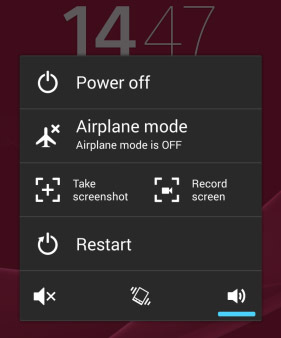 In the screenshot, you can see that a sony smartphone has screenshot option given in the power menu. Especially this setting comes in Sony Xperia Z5. There is a record screen option in the power menu. Which obviously means the same as you can see in the image. There are versions of android, I think earlier than 4.0 where you can’t take screenshots unless you have rooted your phone. Rooting your phone has some serious risks if you are not a technology friendly guy. If you are someone who knows what can happen if you root your Android Smartphone then you are good to go with this method. Rooting actually gives you a complete control of your device. Rooting will give you a lot of freedom. There are many applications in the Playstore which will help you take a screenshot on a rooted Android Smartphone. How can we not share some applications featured on playstore which will better assist you to take screenshots on android? So, let us share some applications. Screenshot Easy – It has an overlay icon which upon pressing anywhere will get a cool screenshot. You can also crop the screenshot. Basically, it does the same thing for you which android original screenshot utility does but there are certain perks, like screen overlay button and cropping options. It has delayed screenshot option as well, like pressing power and volume down button for 2 seconds and this will take a screenshot. Screenshot – Lets you add text on the captured screenshot. You can crop the screenshot and annotate it so that the person with whom you are sharing screenshot understands the purpose. Screenshot Touch – Supports lollipop android on higher. This has a unique option of shake to screenshot. You share your device and it takes the screenshot. So, taking a screenshot on android with only a handshake was never too easy. No Root Screenshot – If you have an android smartphone and that is not rooted. You want to take screenshots on it, but you are helpless. This application comes to rescue you, it doesn’t need any root to take the screenshot. It works on older versions of android too! I love this way most because it involves some geek touch. This works on non-rooted android. However, some people might be running gingerbread and other versions of android. This works well on any android version and helps you take a screenshot. Once installed, open the SDK folder. Go to tools and run DDMS. After some time Dalvik Debugger window will launch. You’ll see your device, click on that and click Device in the top menu. Hit Screenshot. With these above four steps you’ll be able to capture screenshot on any android device. Universal method!